What kind of research goes into book writing? Dark Cityauthor XEUS writes of researching pains and why a writer’s motives are always suspect. Uh, how do you make a man, you know, go ka-boom?” The university chemistry professor sounded puzzled over the phone. I will be the first to say this: researching a book isn’t easy. OK, it’s easy when it’s your field subject in university. But when you’re writing a collection of short stories which are as twisted and disparate as possible, and they involve murder, mayhem, CSI and every one of the seven deadly sins, it appears you have to wear many hats. I used to think Dan Brown must have taken a year off to research The Da Vinci Code, until I found out he hadn’t even been to Paris when he wrote it. Michael Crichton goes one step further for his biblio-technical thrillers. He even quotes his references, journal-like, from research papers. Pick up State of Fear. His references alone take up a quarter of the book. In the course of writing Dark City: Psychotic and other twisted Malaysian tales, I interviewed a prison warden for one of the stories. I could have easily made the whole thing up but I wanted authenticity. I was discontent. I wanted prison to be cramped, tiny cells packed with stifling humanity up to the ceiling. It made for a riveting story. I had visited Pudu Prison once, and the tour guide was telling us four prisoners were in a cell with two beds. “Where did the others sleep?” I asked. Another thing I noticed, the cells were filled with gorgeous ink-drawn drawings. No careless graffiti like #%%* you on prison cell walls; it was as though the prisoners were trying to make their new homes as aesthetically pleasing as possible. And so I merged Pudu prison of the 80’s together with the new one of today, and voila! – I have references that make for good copy. In stories, things must always be happening to the protagonists, usually a conflict of some sort, and the story must always be in dynamic movement, never static. Medicine (not the healing sort) plays a very important role. Research doesn’t have to be live, of course. The Internet and the library are always good places to start. But of course, one has to wade through the entire Inferno section of Dante’s The Divine Comedy to get to what happens in Purgatory. CONGRATS to the birth of a new blog and of course, a new book! I've bought and read your book Dark City and hmmmm, it looks like something exciting is happening to our local writing scene. 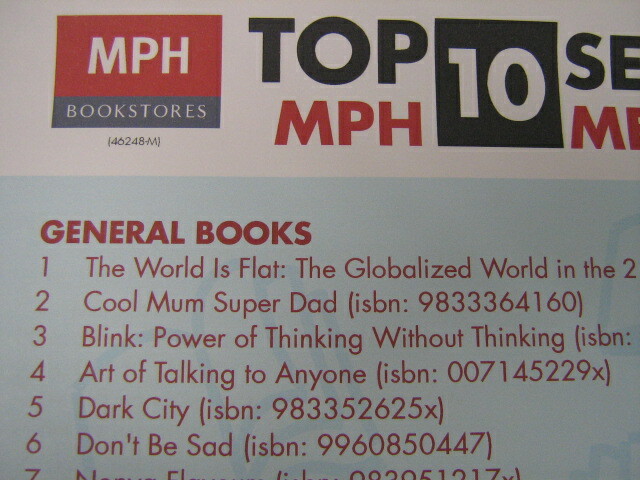 Already, MPH Megastore 1 Utama has a huge poster of your book. That on top of several mentions of your book in The Star for the past weeks. Do keep us informed of anymore features or book talk. Here's looking forward to seeing your title on the best-seller listing soon! Congratulations on your new blog, Xeus! The first post is a great way to kick things off! Er... you are responsible, aren't you? Btw, have linked to your blog. Waddya know? I came here thourhg John! Hey, awesome. Gonna grab your book someday. When is the signing?